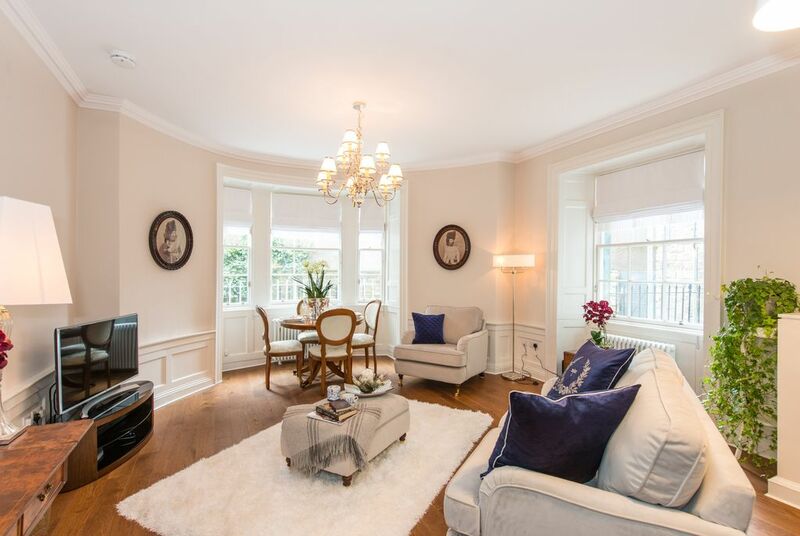 Classic and Elegant Historic Property In Edinburgh City Centre - New Listing! In The Heart of Edinburgh! Ground Floor and quietly situated in one of Edinburgh's historic lanes. After a meticulous refurbishment, a stunning and gracious Georgian apartment, retaining its original historic features. The apartment enjoys an enviable location in one of Edinburgh's most desirable areas and is within a UNESCO World Heritage Site. The City/Airport Tram stop is located less than a 5 minute walk away and Waverley train station is within close proximity - walk 10 mins. You will be spoiled for choice with the vast range of high quality eateries and elegant boutique shopping in the immediate area - everyday grocery shopping is on the doorstep too! Luxuriously outfitted with wood floors, quality antique furnishings and sumptuous soft furnishings - the king size bedroom is an oasis of calm and quietness - the whole emphasis of your holiday is on comfort and functionality with ease of arrival and settling in, for a quick start to your deserved break. All Edinburgh landmark sites are within walking distance and our city tram stop is within a moments walk - the bus is on the doorstep. Upscale designer outlets are reachable within a 10 minute walk - many closer, such as Harvey Nichols, Vuitton and many others. Whilst restoring and maintaining the outstanding original character of the apartment, all care has been taken to provide the comforts and convenience of 21st century living and all effort has been taken to provide a high specification. The Lounge has beautiful period paneling, chandelier, wood flooring and sumptuous velvet upholstered sofas. The Bedroom is situated at the rear of the property and is very peaceful. The bed is a beautiful white oak bed and the mattress is an Ergoflex for supreme comfort. All linens are high thread count Egyptian cottons. Complimentary slipper socks are provided. The Kitchen is a Schull German kitchen with granite tops and all appliances are new. The crockery and glasses are porcelain and crystal - the cutlery and utensils are traditional and period in style. 50" TV with BT TV Cable Network - pay per view via your Netflix and associated accounts. The Bathroom has a fabulous rainfall shower, socket and de-misting mirrors. Laundry is easy with our great 14 minute wash cycle - our washer/dryer is new too! I spend most of my time making our visitors' experiences the very best possible. Our fabulous city, Edinburgh is home for us and we love to experience everything it has to offer too. We have worked hard to give our guests so much more than a hotel offers and our feedback and reviews for our other property tells all! Search SC1314 for a peek! This is our newest apartment and we think we have ticked every box again. Historically important ( 1840's ) - beautifully refurbished it has the very best of furnishings, linen and crockery. If you love velvets, chandeliers, antique furniture and the highest quality crystal, you will feel right at home. The location is city centre, yet quietly tucked away in one of Edinburgh's historic lanes. Surrounded by the very best eateries and independent shops and the city/tram stop a moment away - getting to and from the apartment couldn't be easier. Walk to everything from the apartment and return to the peace and quiet. On inclement weather days, you will be glad you have a beautiful place to chill till it blows over - with the Omni Centre and Playhouse Theatre visible from the doorstep, the location just can't be beaten! We love this house because it retains all the elements of historic living that we adore. Living in this house reminds you of a bygone era, where just outside, horses were stabled and where the 'better off' residents of Edinburgh lived and worked. When we travel we like to experience the very best properties at a reasonable cost and we knew we had captured everything we love about period property when we acquired it. Brand new and beautiful large capacity rainfall shower - Self de-misting mirrors. Nest controlled comfort and 21st century convenience. High thread count egyptian cotton. Waher/Dryer with convenient 14 minute wash cycle. Stunning large bay window - 12 arm crystal chandelier with shades. Silver/grey velvet sofas and footstool with blue velvet and silver adorned cushions. Wood flooring and original panelled walls. Complimentary Tassimo drinks to get you started. Complimentary instant teas, coffee and condiments. All our crockery, utensils, glasses and small appliances are of the very best quality - porcelain - crystal. Fabulous Schuller kitchen with integrated Siemans appliances and luxury silestone worktops. Beautiful antique walnut and damask upholstered dining set. Large HD TV with BT TV network and soundbar. A small selection of books. Guest info and brochures. Beautiful enclosed communal garden - rarely used. The apartment was beautifully and comfortably furnished with many little touches which went above and beyond what was expected. There was even luxury hand cream for after the washing up! The apartment was spotlessly clean and very well maintained. Communication with Alexandra, the owner, was excellent throughout. She greeted us on arrival, gave us clear advice on parking, where to eat etc. The apartment was conveniently located for all the main sights so we were able to walk everywhere. A must stay for Edinburgh!! Fantastic accommodation in a great location! The property is very well presented, comfortable, exceptionally clean and within a short walk to most of Edinburgh's main sights. We met Alexandra at the property and the welcome was wonderful. We was made to feel so at home. Within a short walk are plenty of bars and restaurants where you can get good food and drink at reasonable prices. We had a great visit to the city where the accommodation really made our trip special. I wouldn't stay anywhere else again when visiting this amazing city, missing it already. Apartment was exactly as described. Hostess was wonderful and available in minutes for all requests. I hope to stay here again. Spotless and comfortable home with every amenity. Many thanks for your your review!! A fabulous apartment in a superb location. We had a wonderful time in an immaculate, well equipped and modern apartment. It is cosy yet stylish and incredibly quiet despite its excellent location at only a 5 minute walk to Princes Street. Our host was there to meet us and was very helpful with our questions in the lead up to our stay. We would definitely make a return visit and recommend the apartment to friends and family. A warm welcome from Alexandra, fabulous location for all the sights, we visit Edinburgh many times a year to catch up with friends and family and from know on it will be very difficult to stay anywhere else, what took us so long to find you Alexandra???? The apartment enjoys a city centre location and with that, it is easy to explore Edinburgh's great architecture and visit all it's landmark sites. We also benefit from the vast local services in the immediate area - massage and therapy - beauty works and everyday essential services, such as Post Office and laundry.